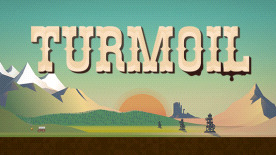 Turmoil offers players a visually charming, tongue-in-cheek take on the simulation genre inspired by the 19th century oil rush in North America. Get a taste of the rush and rivalry of the time as you earn your way to become a successful oil entrepreneur. As you make money digging up and selling oil, the town will grow along with you. Lease land at the town auction and search for oil. Build a rig, create an efficient pipe network and bring up the oil to store it in silos. Sell the oil at the best times to maximize profits. Then buy essential upgrades in town to cope with rock, gas and ice. Acquire more town shares than your competitors in a bid to become the new mayor. Download the Original Soundtrack for FREE! Owners of the game will now get the OST for free as free DLC. This is the Original Soundtrack to the game Turmoil. Music created by Jan Jaap Doeven.